Fig. 1. 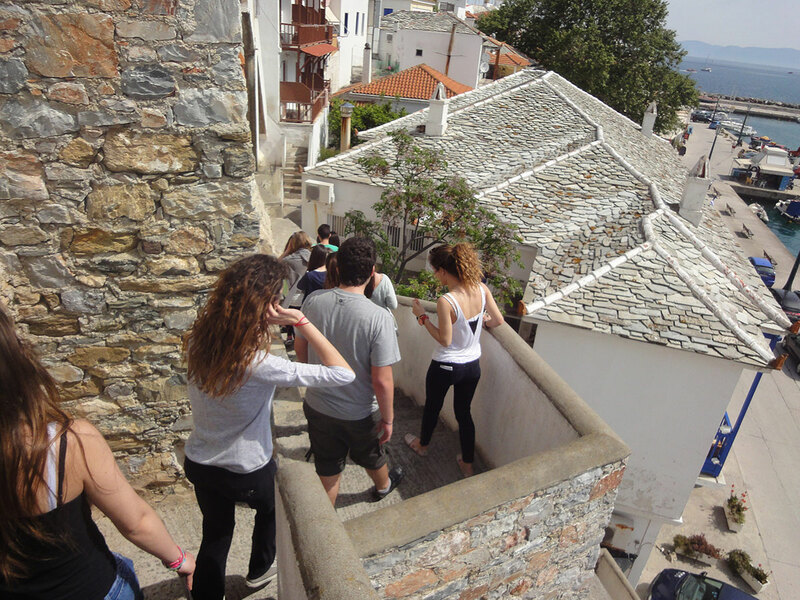 Walking in the streets of Skopelos. 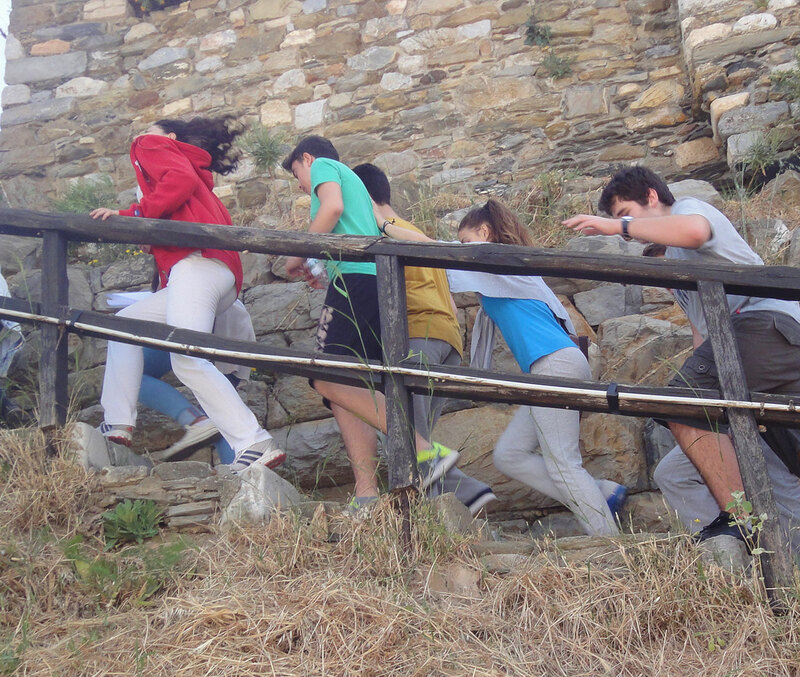 A treasure hunt realized as part of a History lesson in a Lyceum of Skopelos aiming to acquaint the students with the island’s antiquities, proved to be both an effective and amusing tool for experiential learning. 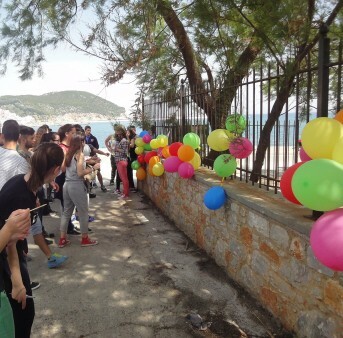 The idea took shape, following the results of a questionnaire answered by the students of the General Lyceum of Skopelos in the winter of 2015, as part of a conference. 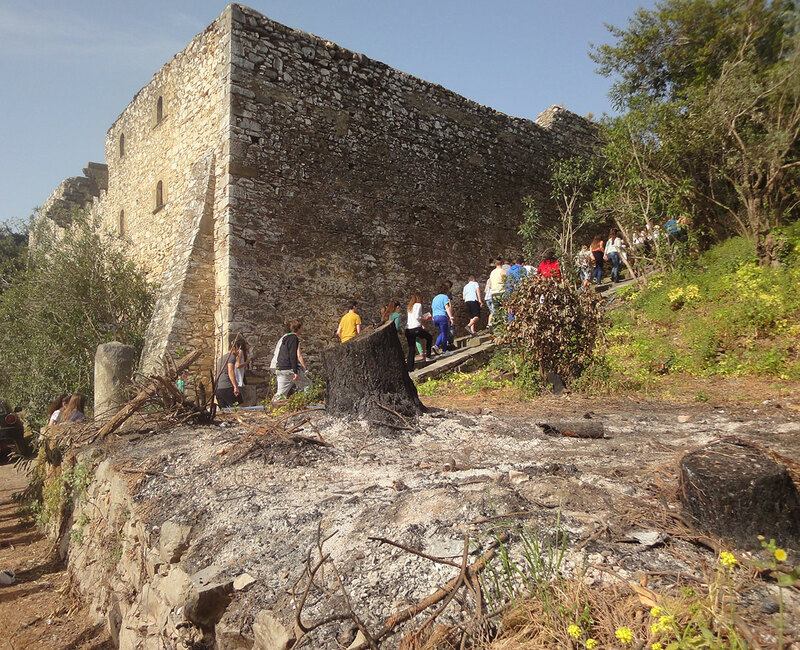 The results that were recorded and thoroughly analyzed, proved in a relative announcement (note 1) that the students have a vague, confused picture of the past and do not have the possibility of participating in some educational programme within the school, due to the island’s isolation. The specific problem triggered the quest for innovative activities that were possible to be realized in a border area with limited resources.Αt the conference mentioned above ,the idea for a treasure hunt had in fact been proposed, with stops at points of archaeological interest, passed by all of us on a daily basis. The Treasure Hunt is a game about originality,intelligence, knowledge, behavior, observation and speed (note 2). This is the reason it has been used by Greek teachers as an experiential, team collaborative and interdisciplinary activity that aims to sharpen critical thought and develop the students’ initiative, but also bring them in touch with the local community (note 3). Known examples till now,however, are restricted to younger age groups and feature a wide use of Information and Communication Technologies, popular in education over the last years. 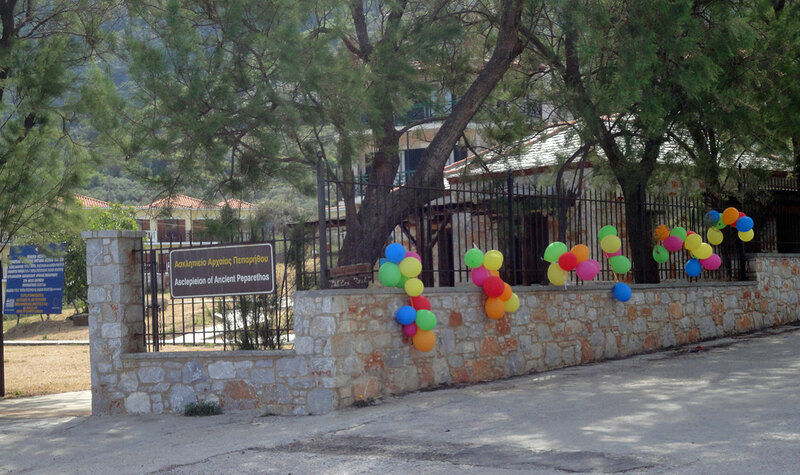 Therefore, the games remain on the internet; either with puzzles of different specialties, such as the interdisciplinary, internet game for the 3rd Gymnasium in Kambani Killkis (note 4), or with puzzles related to local history from the period of Turkish rule for the 5th and 6th Grade in the Primary School of Chania (note 5). At the same time, the treasure hunt has been used as a separate tool in learning and active participation in support of the Environmental Education programme (note 6). 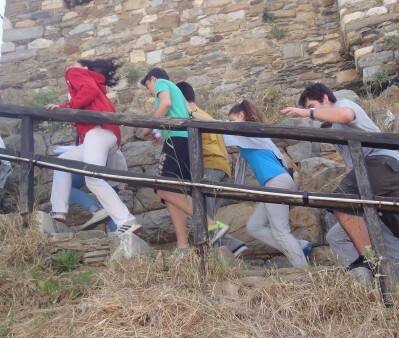 The originality of this project is therefore twofold: in the case of Skopelos the game was designed for students of the Lyceum and exclusively associated with archaeology. 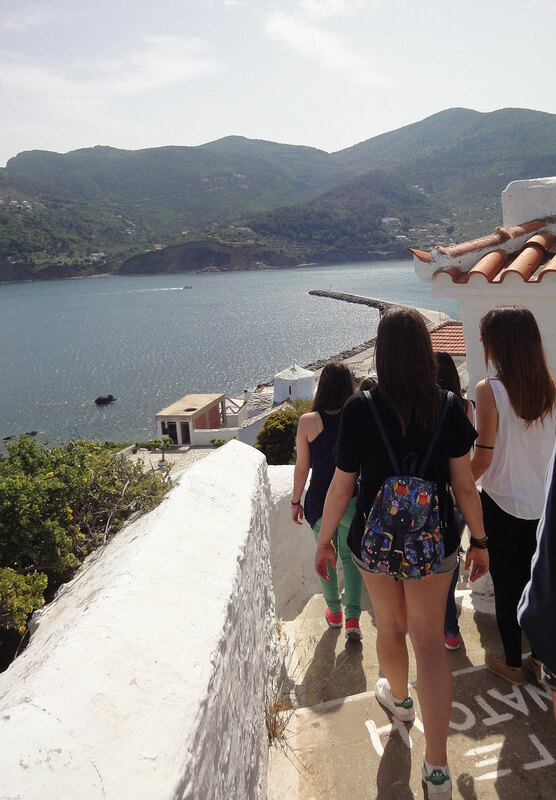 We considered it very important that, shortly before graduating, the island teenagers should tour Skopelos, discover its hidden antiquities and get better acquainted with their town. We were justified by our choice, since the students were enthusiastic about the activity both for its organization and its implementation. The results also changed the opinion held by quite a few teachers, that as the Lyceum is closely linked with the entrance into Higher Education, students are not interested in extra curricular activities and are too old for games. 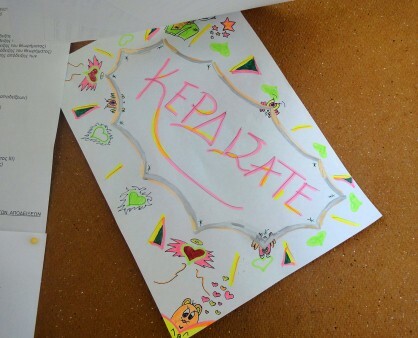 Without the use of technology, equipped only with a notepad and pen, we located hidden messages in the town, solved riddles and touched antique remains, learning in an experiential manner about the history and culture of Peparethos. The treasure hunt was made up of two basic stages, namely its preparation and implementation. For the first stage, two hours were spent in the class room and three outside school. Three hours of the curriculum were spent for the second stage, on the penultimate day of the school year. The first stage of the preparation lasted five hours, involving 20 students from the 1st class of the Lyceum. In the first hour, the students worked in the school library during the History lesson, in 5 teams each made up of 4 students. Each team chose a monument in Peparethos, i.e. ancient Skopelos, studied two or three extracts from scientific works and composed a text with the most important information. The second hour, all the students in collaboration with their teacher, this article’s writer, prepared the riddles and mapped the route of the game through the town. The afternoon of the day before the start of the game, 14 out of 20 students voluntarily offered to help in the preparations, despite their heavy study programme. Together we constructed and hid the riddles in spots of archaeological interest. It is worth noting that the students with not particularly high grades were the ones who showed a special interest both in the organizing and the realization of the game. The 2nd stage, i.e. the playing of the game, was realized at the end of term, on May 7th 2015 and lasted 3 hours. 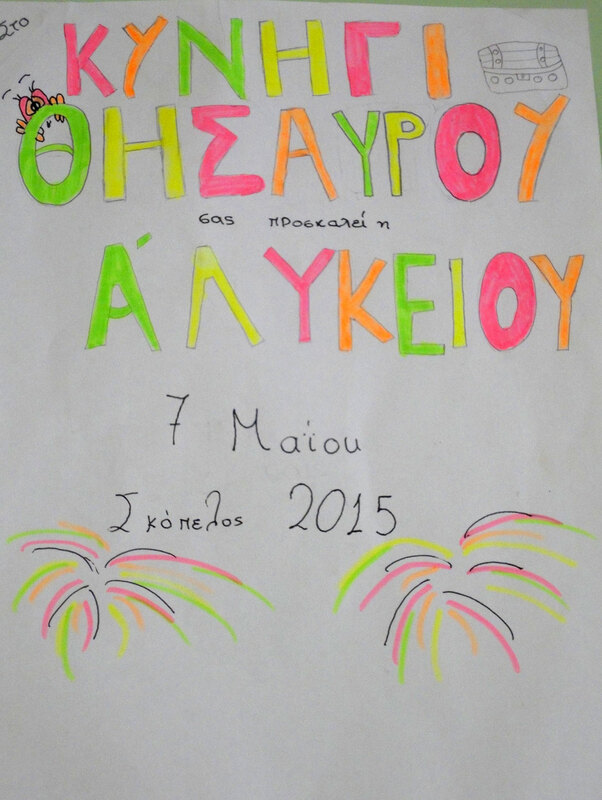 A poster, created by a student from the 1st form of the Lyceum, was put up in the school entrance (fig. 2). All students from the Lyceum of Skopelos, in the school grounds that day, participated in the game along with three accompanying teachers (note 7). The students of the 2nd and 3rd form of the Lyceum, taking part in the game, were divided into six teams, each with a leader (note 8). Every student from the organizing 1st form of the Lyceum, had undertaken a specific role in the game, with one or more responsibilities chosen by him/herself. At this point, a decisive factor was the encouraging of students to take on activities, especially of those who hesitated or were undecided. Special care was given to the taking on of the following specific responsibilities by each student: a) Two students made up the secretariat and registered the members and the head of each team, which had its corresponding colour, b) Five students tied ribbons round the hands of the team members with their team colour, c) Four students handed out a pen and note pad to the heads of the teams and read them the rules of the game , d) Six students handed out the first riddle to each team, e)Three students were judges, received the answers from the teams and noted the scores throughout the game, f) Six students crowned the winners at the end, g) One girl student was the game’s photographer and h) Seven students briefly and concisely presented the text composed by their team in the library , about each of the town’s monuments . In this way, all students from the organizing class were given the chance to participate in the game in whatever way they wanted and get actively involved in the process. Each team tried to locate the hidden piece of paper on which the riddle was written and then attempted to solve it (fig. 3). The hiding places were not particularly difficult to find, so as to not delay the process, as we had put particular emphasis on solving the riddles and locating the antiquities. Each team’s answer was written in the notepad it had received at the start of the game (fig. 4) and given to the judges who confirmed whether or not it was correct. In the case of a wrong answer, the team had the right to try again as many times as it wished. For the process to be completed, all teams had to give an answer or announce they were giving up trying. The team to answer first, received 30 points. The second, third, fourth, fifth and sixth team received 25, 20, 15, 10 and 5 points respectively. If any team gave up without answering, it got a zero. The note pad contained a pair of tools, a table and a text that were to be used as aids by the students in solving the corresponding riddles. Moreover, a small wooden cane was used to locate the paper on which the eighth riddle was written. The cane had been given to the teams at the start of the game, without them knowing its use. 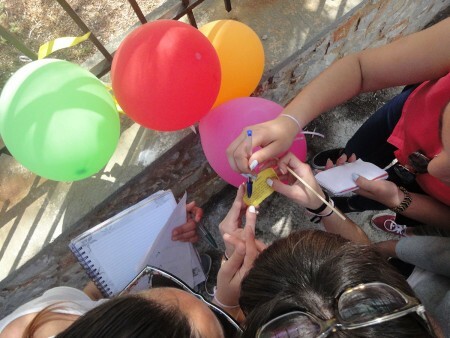 The students used it to burst balloons that were tied with the colour of their team (fig. 5) and inside found the paper with the riddle (figs. 5-6). The balloons were filled with salt, for their contents to be invisible. The above trial added a playful note to the whole process and amused the students a lot, both when they played the game and while organizing it. Each time a procedure was completed, the students received relevant information about the monument from the 1st form Lyceum student responsible and kept notes in their pad. When some explaining was thought necessary, the teacher and writer of this article intervened. Next, we all went off to the monument shown by the riddle, walking through the town’s lovely little streets (figs. 1, 7, 8). It is true that it would have been preferable for students to move in a different order towards the various spots in the town, but then we would have needed more accompanying teachers, one for each team, so the idea was abandoned. Moreover, to ensure the students’ safety when crossing the town, no importance was attached to the speed of arrival at each spot, but only to the solving of the riddle. In all, the students answered 9 riddles with different styles and level of difficulty. 4 of them were easy and the remaining 5 difficult. The easy riddles were charming small poems and a brief text, allowing all students to solve them with ease, so as to boost their confidence and continue playing the game with enthusiasm. Two out of the 5 difficult riddles were solved with the help of an equal number of clues, found in the note pad that the teams had been provided with at the start of the game. The first one contained five numbers and three lines of verse. The students had to use the first tool in their pad and this included the ancient Greek letter numerals which, combined with a corresponding letter of the Greek alphabet, made up the name of the required location. The second riddle contained the inscription found on the wall of Saint Michael Synnadon (note 9), written in the boustrophedon style. To read the text, the students used the clue giving them information about the following three styles of writing in ancient Greek inscriptions: “epi ta lai” [meaning from right to left], “boustrophedon” and “es to evthy” [meaning from left to right]. The rest of the riddles included a rebus puzzle and the combination of a little story, a votive image and an inscription that had to be completed with the scattered letters given. The last and most difficult riddle, given to the students in the school court yard, was a crossword puzzle with 19 questions related to the history and archaeology of Peparethos. This summed up all of what they had seen and recorded, when listening to the projects of students from the 1st form of the Lyceum, about their town’s monuments. In the treasure hunt, we mapped out a route in the town of Skopelos for the students to locate and acquaint themselves with the antiquities they passed by daily, without paying attention to them. Thefollowing route was taken: Episkopi, Panaghia Eleftherotria, Kastro (the Castle), Michael Synnadon, Aghioi Apostoloi, Asclepeion, The Lyceum of Skopelos. The first stop was Episkopi, a district known to everyone, a property owned by the Dimitriades brothers and located near the Lyceum, at the beginning of the road joining the town of Skopelos with the settlements of Panormos and Glossa (fig. 9). It is a fortress like building made up of two stories with narrow windows and struts, in the style of a Venetian mansion (note 10). It was supposed to be used as the Bishop’s residence in the 15th-16th century. Protruding on the upper part are stone supports with carved figures of animals, of a balcony never built. The construction remained incomplete due to financial difficulties and included a basilica of 1078 that replaced a basilica of the Early Christian era. In the mid-16th or early 17th century, a single aisled vaulted basilica of Panaghia was built, whose outer enclosure stands on the foundations of the Byzantine basilica’s south wall. The presence of ancient building material, such as Ionian column capitals (note 11), statues, inscriptions and tomb steles come from an ancient sanctuary and a cemetery from the district. This material was either in the walls of various buildings, found in excavations or transferred at some point to the Episkopi courtyard. The second riddle hinted at the church of Panaghia Eleftherotria (fig. 10), where a sarcophagus was found in the wall on its SE corner (note 12), complete with its lid, made by the team of the workshop of Assos in Asia Minor, dating from the late 3rd century AD. The next stop was Panaghia Faneromeni, where, to the left of the church door, a funerary relief is found in the wall, depicting a man on foot with his horse, possibly from the Hellenistic period (note 13). The fourth stop was the Castle where –as its name implies– a section of the strong wall of Peparethos survives, dating from the 13th century AD and built on an earlier wall of the 4th century BC (note 14, fig. 11). The wall of the Classical period is constructed of large boulders of local grey limestone, that suggest polygonal masonry and are completed by smaller blocks and small flat stones of various sizes, perfectly fitting together in a horizontal position (note 15). 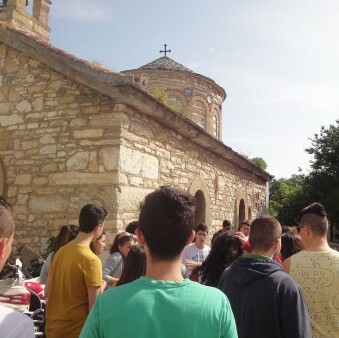 The next two riddles led to the churches of Aghios Michael Synnadon and Aghioi Apostoloi. The former (note 16) bears ancient construction material in the walls, inscriptions , tomb steles as well as two lids and five sections of sarcophagi , made by the team of the workshop of Assos in Asia Minor, from the late 3rd century AD. The Aghioi Apostoloi church in the “Vrachos” location is said to be built over the temple of Athena which, according to an inscription (note 17), was founded in 197 BC, when the town was being rebuilt following its destruction by Philip V in 200 BC. The seventh riddle led to the Asclepeion, most important place on Skopelos and the only visited archaeological site in the North Sporades (note 18, fig. 12). It is one of the most ancient in Greece, founded probably in the 5th century, flourished in the 4th and operated at least up to the 2nd century BC, while the place continued to be used until the early Byzantine era. The sanctuary consists of a colonnade with at least three rooms which enclosed an inner courtyard on three or four sides, with a built brasier or altar for bloodless sacrifices. 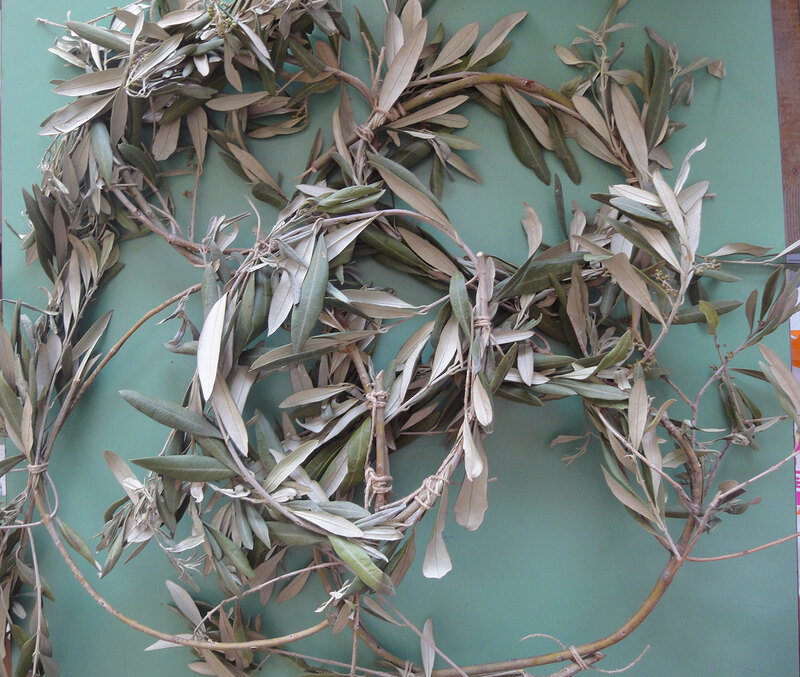 The next riddle led to the last spot in the town, none other than the Skopelos Lyceum. The winner was the team to receive the most points. Its members were led to the place shown by letters selected from the crossword, i.e. to the school’s Bulletin Board, where they found the relevant poster that wrote “You have won!” (fig. 13). The students from the first and second teams were crowned with olive wreaths (fig. 14). At the end, everyone was offered pastries. 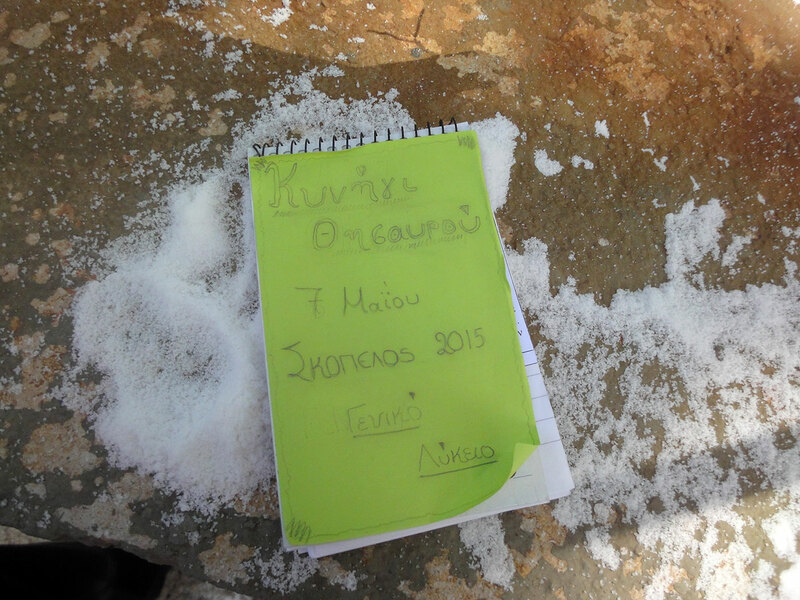 The Treasure Hunt in the town of Skopelos was a great success and left positive impressions both with the students and the local community. Special mention was made in the local press (note 19), while the event was posted on the school website (note 20). The conclusions reached are particularly interesting. The game served as an amusing tool for experiential learning that is integrated in society, away from the classroom and the isolated school area. Students were able to draw on information learned in their history classes during the school year and use it to solve the riddles. At the same time they developed additional skills, such as being observant and imaginative, they took creative initiatives and sharpened their critical thinking, gaining new information related to monuments they knew next to nothing about. A particularly interesting fact was that students that were lower than average academically, got over their initial reserve and enthusiastically showed a lot of diligence and interest in the game, presenting a very positive attitude and collaborating with both their peers and teachers. Moreover, all the teams correctly answered most questions from the crossword puzzle, confirming that they had learned in an experiential manner about the topography, history and archaeology of Peparethos. 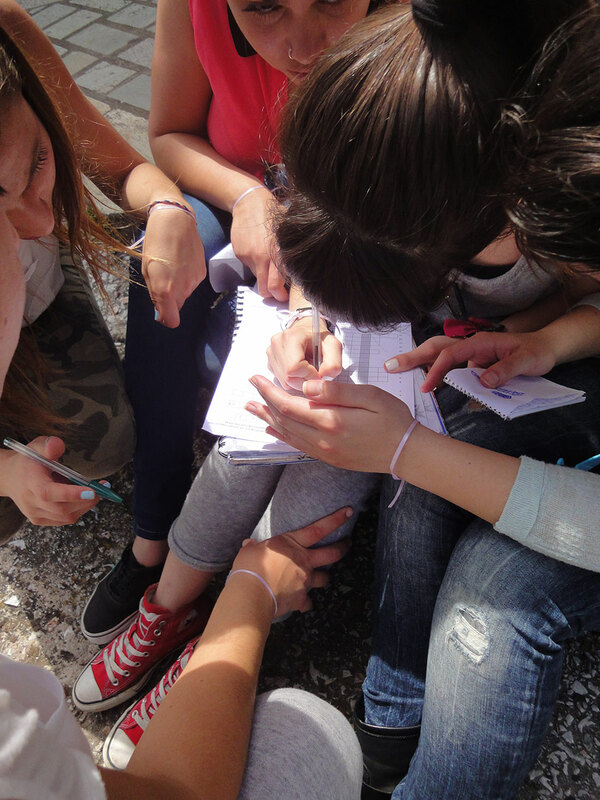 To sum up, the treasure hunt can really be used by other school units as a tool for experiential, collaborative, interdisciplinary learning, with positive results for students. 2. Δημοπούλου et al. 2003. 3. Καλαϊτζιδάκη 2012, p. 2. 5. Ψαρουδάκης et al. n.d.
6. Καινούργιου et al. 2010. Καλαϊτζιδάκη 2012. 7. We extend our warm thanks to the School Principal Mrs Kokkitsa Katsikogiannis for helping us realize our idea and also to the accompanying teachers, philologist Mrs Georgia Kelepouri, English teacher Mrs Jenny Tsivouli and gymnastics teacher Mr Apostolis Sotis. We would also like to especially thank Mr Iakovos Georgiou the archaeologist in charge and the guard Mr Kostas Nikolaou for making the site of the Asclepeion available to us. 8. 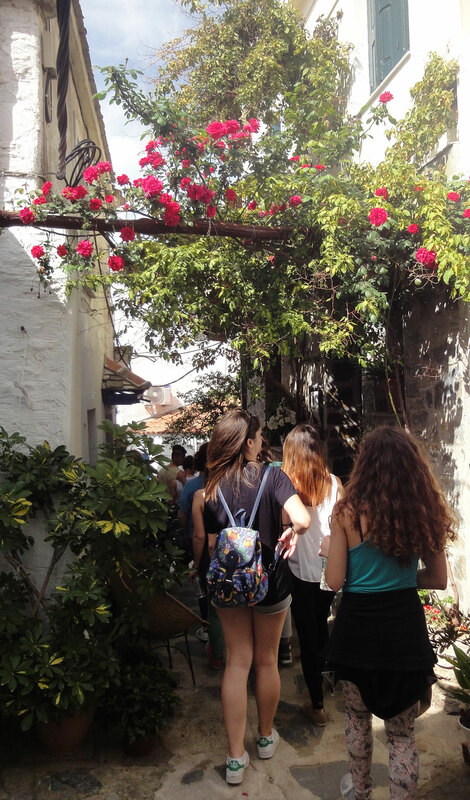 It should be noted that, during the academic year, the following number of students were enrolled at the Lyceum of Skopelos: 20 students in the 1st class, 27 in the 2nd class and 21 in the 3rd class. 9. Δουλγέρη-Ιντζεσίλογλου 2009. 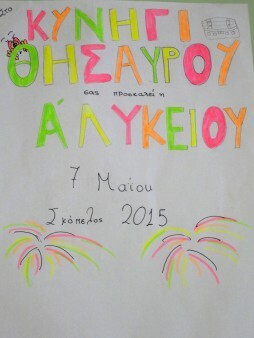 Τζαβελοπούλου 2015a. 10. Γεωργάρας 1906. Ξυγγόπουλος 1956. 11. For details on the material see Σάμψων 1973. 12. Fredrich 1906, p. 111, note 1. Bruneau 1987, p. 485, fig. 5 and 12. Σκαφιδά 2000. 13. Σάμψων 2000, p. 210 no. 5, fig. 61 (note that the photograph is printed the wrong way round , i.e. from left to right). 14. Fredrich 1906, pp. 110-112. Δουλγέρη-Ιντζεσίλογλου et al. 2004, p. 12. Σάμψων 2000, p. 116, figs. 15-17. 15. According to Fredrich (1906, p. 112) this technique is found in all masonry of Peparethos, such as the Panormos wall and the wall of the Asclepeion, as well as in Skiathos and Skyros. 16. Fredrich 1906, p. 111 note. 1. Bruneau 1987, pp. 481-485, fig. 5 and 10-11. Σάμψων 2000, p. 217 no. 2, figs. 69- 72. Σκαφιδά 2000. Δουλγέρη-Ιντζεσίλογλου 2009. 17. IG XII 8, 640 στ. 37-38 = Syll3 587. For details on the site of the earlier temple destroyed by Philip the Vth and the argument concerning the possible founding of the new temple of Athena on the ‟Vrachos”site, see Τζαβελοπούλου 2015a. 18. Δουλγέρη-Ιντζεσίλογλου 2006. Δουλγέρη-Ιντζεσίλογλου et al. 2012. See collected bibliography Τζαβελοπούλου 2015a. Bruneau Ph. (1987), «Peparethia», BCH 111, pp. 471-494. Γεωργάρας Ν.Γ. (1906), «Ο Βυζαντινός ναός της Επισκοπής εν Σκοπέλωι και ο Επίσκοπος Αναστάσιος», ΕΠΕΤ. ΠΑΡΝ. 9, pp. 19-28. Γιαγκούλης Ν. / Γενιτζές Α. (2010), «Το κυνήγι του χαμένου Θησαυρού: ένα Διαθεματικό, Διαδικτυακό παιχνίδι»,2nd Panhellenic Educational Conference in Imathia,Digital and Internet applications in Education, Veroia-Naousa, 23rd- 25th April 2010, pp. 1817-1824. Δημοπούλου Μ. / Μπαμπίλα Ε. / Φραντζή Α. / Χατζημιχαήλ Χ. (2003), Εξερευνώ την πόλη μου(I explore my town),Proposals for designing interdisciplinary projects (Προτάσεις για διαθεματικά σχέδια εργασίας), Καλειδοσκόπιο, Athens. Δουλγέρη-Ιντζεσίλογλου Αργ. / Παλιούρας Δημ. / Ξηντάρης Άγγ. (2004), From the harbour of Peparethos to the harbour of Skopelos (Από τον λιμένα της Πεπαρήθου… στο λιμάνι της Σκοπέλου), Port Authorities of Skopelos, – Archaeological Institute of Thessalian Studies, Skopelos. Δουλγέρη-Ιντζεσίλογλου Αργ. (2006), «Το Ασκληπιείο της Πεπαρήθου», ΑΕΘΣΕ 1 (2003), vol. 1, pp. 263-281. Δουλγέρη-Ιντζεσίλογλου Αργ. (2009), «Ο Λύκειος Απόλλων της Πεπαρήθου», Κερμάτια Φιλίας: volume in honour of Ioannis Touratsoglou,Numismatic Museum of Athens, Athens, vol. B, pp. 471-479. Δουλγέρη-Ιντζεσίλογλου Αργ. / Γεωργίου Ι. / Γεωργίου Κ. / Πέτση Κ. / Βλαΐδη Ρ. / Δερμιτζάκης Σ. (2012), «Το Ασκληπιείο της Πεπαρήθου. Έξι χρόνια μετά ...», ΑΕΘΣΕ 3 (2009), pp. 701-708. Fredrich C. (1906), «Skiathos und Peparethos», AM 31, pp. 99-128. Καινούργιου Σ. / Χατζημιχαήλ Μ. / Τσιάκαλου Μ. / Κοσκολού Αλ. (2010), «Το παιχνίδι του Κρυμμένου Θησαυρού: Εργαλείο Μάθησης και Δράσης»,5th Conference of the Panhellenic Educators Association for Environmental Education (ΠΕΕΚΠΕ), Ioannina, 26th -28th November 2010. Καλαϊτζιδάκη Μ. (2012), «Προωθώντας βιώσιμες πρακτικές στην πόλη του Ρεθύμνου με ένα περιβαλλοντικό κυνήγι θησαυρού», 6th Conference of ΠΕΕΚΠΕ, Thessaloniki, 30th November-2nd December 2012. Ξυγγόπουλος Α. (1959), «Ο ναός της Επισκοπής Σκοπέλου», ΑΕ (1956), pp. 181-198. Σάμψων Α. (1973), «Επισκοπή Σκοπέλου, ένα υπαίθριο Μουσείο», Archives of Thessalian Studies 2, pp. 267-279. Σάμψων Α. (2000), Η νήσος Σκόπελος. Ιστορική και αρχαιολογική αφήγηση, Athens (1st edition 1968). Σκαφιδά Ε. (2000), ΑΔ 50 (1995) Β1, pp. 367-368. Τζαβελοπούλου Κ. (2015a), «Ιερά και Λατρείες της αρχαίας Πεπαρήθου», ΑΕΘΣΕ 5, Volos, 26th February-1st March 2015 (forthcoming). Τζαβελοπούλου Κ. (2015b), «Η αρχαιολογία μέσα από τα σχολικά εγχειρίδια του γυμνασίου: Εμπειρία από τη σχολική πράξη και προβληματισμοί»,Interdisciplinary Conference: Archaeology in Greece today. Monuments and People in Crisis, Union of Archaeologists of Greece ‟IOS”, Athens, 19th -20th March 2015 (forthcoming).